Camouflage even the biggest messes in record time with the Kidz World Real Tree Toy Box. This spacious upholstered toy box is sturdy enough to sit on and is just the ticket for toy organization in your playroom, cabin, or hunting lodge. It's also fantastic as storage for off-season clothing or extra bedding, or as a bench at the foot of a bed. 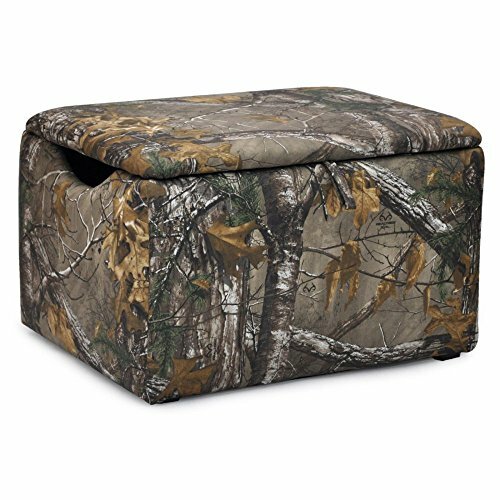 Real Tree ''Xtra'' Camouflage fabric in a polyester cotton blend dresses this upholstered box up with natural looking, three dimensional leaf and branch patterns. The sturdy wooden frame has slightly recessed curves on both sides and air holes for circulation. Plastic feet on each corner respect your flooring and keep the fabric from contacting the floor so it can last longer. A safety hinge maintains the lid at whatever angle you lift it to so that it won't fall on little fingers. Dimensions: 28W x 20D x 16H in.. Mixed hardwood frame with poly/cotton upholstery. Recommended age: 4 Years and Up. 3D Real Tree camo in your choice of color. Safety hinge prevents pinched fingers. Strong enough to sit on. CARB compliant; Made in the USA. Dimensions: 28W x 20D x 16H in.